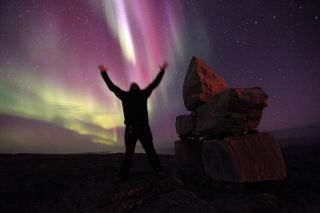 Sylvain Serre of Ivujivik, Quebec, Canada, captured this aurora shot on September 3, 2011. He commented: "For the first time of the season, there was a clear sky in the Northern village of Ivujivik (the highest point in Quebec)." The first wave in a volley of solar storm particles from the sun hit Earth Friday (Sept. 9), setting the stage for what could be a striking weekend light show for observers at high latitudes in the Northern Hemisphere, skywatching experts say. The charged solar particles were expelled by the sun during a series of sun eruptions (called coronal mass ejections, or CMEs) this week. They arrived at Earth Friday, were funneled toward the poles by the planet's magnetic field and began interacting with the upper atmosphere in what scientists call a geomagnetic storm. "This could be the first of several hits from a series of CMEs to reach Earth during the weekend," the space weather and skywatching website Spaceweather.com wrote in an alert. "High-altitude sky watchers should b e alert for auroras after nightfall." The sun erupted with three major solar storms this week between Sept. 5 and Sept 7. The third and largest of the storms was an X2-class solar flare, placing among the strongest types of storms the sun experiences. The coronal mass ejections from the flares were not aimed directly at Earth, so they were not expected to interfere with satellites, power grids or other infrastructure, space weather experts said. Major solar flares have already created dazzling northern lights for skywatchers throughout this summer. In August, a series of solar events set the stage for an amazing weekend display, according to some observers. On Aug. 5, skywatcher and photographer Colin Chatfield witnessed an impressive aurora display just outside Saskatoon in Saskatchewan, Canada. "We don't actually see the aurora too often here, even though we are more north than lots of your audience," Chatfield told SPACE.com in an email, adding that while this year's auroras were a bit dimmer than those of August 2010, he did manage to catch a meteor streaking across the sky this time. "Even though the ones [on Aug. 5] were not as impressive as last year, they were still amazing to watch them develop, then dance overhead." Editor's Note: If you snap an amazing photo of the northern lights displays this weekend and would like to share it with SPACE.com for a possible story or image gallery, please contact managing editor Tariq Malik at: tmalik@space.com.